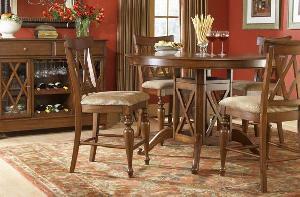 ADF-015 : Round Dining set made from solid mahogany wood with smooth finishing with bun feet chair. Available in various colors, dark brown, medium brown and light brown color. For further information about our products, please visit our online catalog and contact us. We produced many items for teak outdoor and wooden indoor. Some of new design not listed in our online catalog, so contact us.